Emulsification is a process by which you mix two liquids that normally do not mix well together. Emulsification of fats allows you to mix them with water-based substances, which has important implications for cooking and for digestion. To emulsify fats, you need substances such as bile salts or other compounds that help connect the fat and water. The adage "oil and water don't mix" is based on the characteristics of hydrophobic versus hydrophilic interactions. Fats are hydrophobic, which means they appear to avoid water and instead form large globules when mixed with a water-based liquid. However, this happens not because the fat molecules actively avoid water, but because the water molecules prefer to bond with each other rather than with the fats. Water is a "polar" molecule, and fats are "non-polar", explains the International Society for Complexity, Information and Design. Polar molecules prefer to bond with other polar molecules. Emulsification of fat means that you change the environment so the fat and water molecules can mix together more easily. Typically this requires you to add a compound, known as an emulsifier, which can serve as a bridge between the fat and water molecules. Emulsifiers typically have one end that is polar and one end that is non-polar. 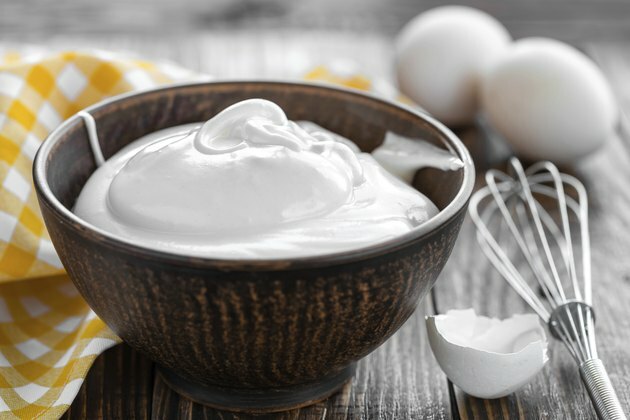 Emulsifiers can be found in egg whites, mustard, gelatin and skim milk. They are important for making mayonnaise and other foods that combine fats and water-based liquids. Emulsification of fats is also a critical part of digestion. Most of the fluid in your digestive tract is water-based, so when you consume fats, they tend to form large globules in your intestines. When the fat is in large globules, it is hard for the enzymes in your digestive tract to break down dietary fats. Large globules of fat are also poorly absorbed by your intestines. As a result, your body uses an emulsifier known as bile to break up these fat globules. Bile acids or bile salts are produced by the liver and stored in the gallbladder. When you eat a meal with fat, bile is released from your gallbladder into your digestive tract. Bile has two sides. One side of bile is hydrophobic, and the other side is hydrophilic. Bile is made up of a steroid molecule, which comes from cholesterol, and a small side chain that has hydrophilic sections. Why Is Lecithin a Good Emulsifier?